With its well-preserved architecture and tranquil atmosphere, Weishan's capital is Yunnan's most beautiful county town. Weishan Gongshen Tower: Gongshen Tower 拱辰楼 in the center of old Weishan. Even though the Weishan basin played an important role during Nanzhao times, the present town, known then as Menghua 蒙化 dates only back to 1389 after the Ming had routed the Mongols in Yunnan and were founding garrison farms to cement Chinese rule: Weishan was one of them, its Muslim population descendents of the soldiers stationed here. 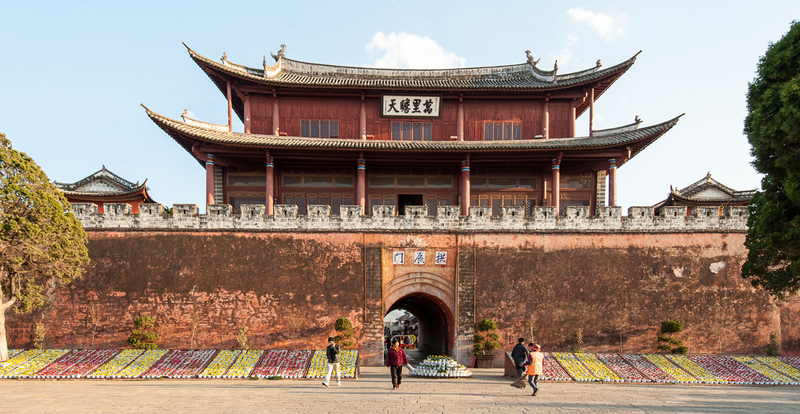 Like almost all towns, Weishan had a wall of which today the large Gongshen Gate 拱娠楼 survives: the beautiful gate is the focal point and the centre of the old city. Weishan's road layout still betrays the layout of the old city walls. Gongsheng gate guarded the northern approach, from Dali, to the town, with the walls running up and down present-day Xixin Road 西新街 and Dongxin Road 东新街. On the eastern side the walls than followed modern Eastern Weicheng Road 巍城东路, on the western side Western Nancheng Road 南城西路. Around the Gongshen gate shophouses have been lovingly restored and the square has - especially in the evening - a very nice feel to it. To the south runs a pedestrianised street that was once Weishan's main street. Most traditional shop-houses have been preserved as well as a number of pavillions along the street. In middle of the road, where historically Weishan's centre would have been is Xinggong Tower 星拱楼, another fine example of early Ming architecture. At the southern end of town still stands a solitary pagoda Wenbita 文笔塔 in the fields. It was first built at the town's foundation, but has been reconstructed a number of times, the last in 1860. Another pagoda stands on the top of a hill much further away. Daxiao Temple 大小寺 lies to the east of the county town, with the Small Temple in front in fact larger than the one behind. The first, Xunzhu Temple, dates probably back to the Nanzhao period, but it has been rebuilt many times, the last during the Qing period. The temple fair takes place on the ninth day after the beginning of the lunar year, allegedly emperor Yuhuang's birthday. Little is seen of Mong-hoa [Weishan] from the outside above the blackened city walls, except a two-storied pavilion, the two-storied gateways and the official wei-kans. The city is not visible until close up to it, on account of a rising ground, which hides it from the south approach. The town looks commonplace, and has the usual air of sameness of other Chinese towns. It very large and well-built, and far superior to any we had yet seen. It bears the unmistakable air of great form, prosperity and importance. Several very handsome pai-fangs [paifang - memorial arch] in fine sandstone, with marble tablets, stand near the northern approach, and, strange to say, only one of these, due no doubt to the better Mahomedan taste, has been disfigured by the usual grotesque daubs of colouring. The others, handsomely carved in good, honest stone, formed a pleasant contrast to the one decked with a mass hideous red and green paint.